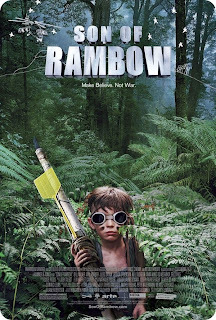 Yes, Rambow. The son of. Two kids making a sequel to the 1985 cult classic, First Blood. (So it is a movie about making a movie about a movie!) They start off small and eventually engulf most of the town's other children in the production. Some character development. Yadda yadda yadda. And then the light hearted ending. Son of Rambow is a very original movie. Some good writing. Though a bit cliche in places. Predictable in others. Good directing. I especially liked the odd animated sequences. The french kid threw me for a loop. But I eventually grew to like him. Despite the accent. Pacing was a touch slow and lingered at times. But overall, I enjoyed the departure from the norm. Very refreshing and unexpected. Date flick? I think so. At least for a light, casual sort of thing. Kid flick? Could be. I don't recall anything that wasn't appropriate. Most deserving of a rental. Iceland officially gives up the ghost.